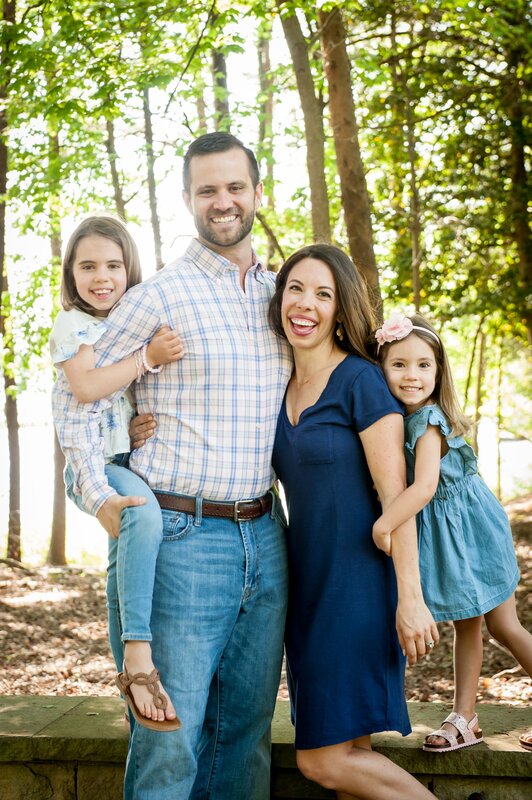 I planned on sharing my favorite tips for taking pictures of my kids with y’all today, and I promise that requested post is in the works, but I have to share an embarrassing fact first. Yesterday I opened Hailey’s bedroom door to get her up for the day and I swear- it stunk. Maybe it was a visual foulness of seeing piles of stuff in every corner, but it seemed conspicuous enough to me to warrant some serious attention. As I took inventory I confirmed that my six year old had inherited her mother’s hoarding habit, so determined to nip it in the bud, I prepared myself for afternoon conversations about each item to determine what was “special” enough to keep. Then I stripped her sheets and quilt for the wash as I pushed all other afternoon plans aside. It was clear I needed a chunk of time so I could properly tackle this mess, A Simplified Life style, AKA, getting rid of most of it. 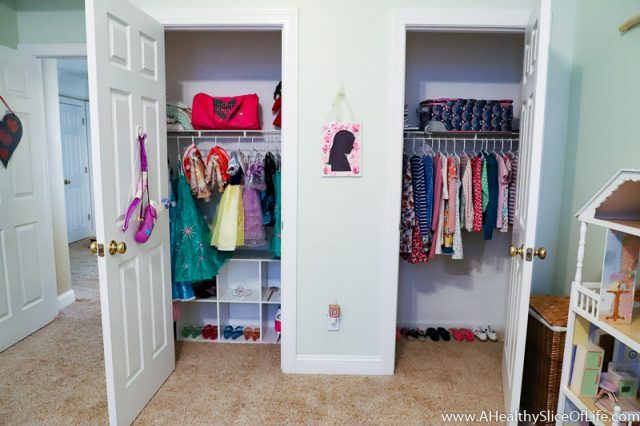 Ugh, do you see that closet? I’d ignored the chaos long enough and decided to start there after we got home from Hailey’s first gymnastics class (spoiler- she LOVED it). First, I pulled everything out, then divided things into three piles: keep, give away, trash. I tried to apply the same ruthlessness as I did to our master closet. I gave away the “itchy” princess dresses that the girls never wore and threw away the ones that had tears and holes. I saved a few special outfits to pass down to Kaitlyn, but donated the clothes that still had some life in them but weren’t worth packing away in a bin. It was a process, but 3 large garbage bags later, it was worth it. I had Hailey’s help with the rest of the room. We went through each pile, beginning with the dolls. She decided which ones she just had to keep and which ones she could give away to another child. We went through a million trinkets, keeping the swim medals and (finally) tossing the snowman PEZ dispenser. We went through the books, found some great ones to move to Kaitlyn’s room (she feels like she just won the book lottery! ), and had a few piles of keepers. I bought a cheap bookcase at Target (it feels cheaper than Ikea but I think it will serve its purpose fine) and as soon as David puts it together she’ll have a space to keep them besides on a huge pile at the end of her bed. After washing and drying and sorting and organizing and filling up the back of the car and the trash can- it was done! By the way, I highly recommend this book light. It has a bright and soft setting, it is sturdy, and is easy to maneuver into different positions. It’s been awesome for Hailey to read at night. Also, I hope they keep their loveys forever. Hailey said one (of the four) could go, but I snatched it right up and put it in her memory bin. No way, Jose. Now as for the treasures that Hailey just couldn’t part with. Honestly they made me smile because she is pretty similar to me in that she wanted to keep pictures the most, then small trinkets that reminded her of people (a pink bunny from Mema and notes Nana had left her) or of places we’d been (the wishing star from Cinderella’s castle or the shiny rock from Colorado). The whole process took two hours, which really wasn’t all that long for the payoff of a like-new room. 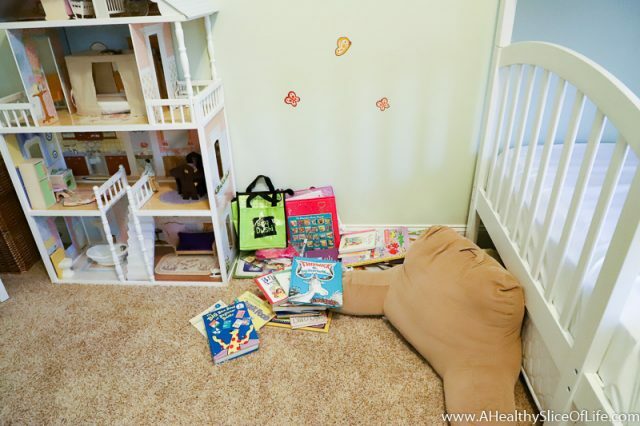 Hailey twirled around the room and kept saying how much she “just LOVED it.” I tried to explain the concept of every item having a designated place and the importance of putting things back where they belong and I’m crossing my fingers that just a little of the advice sunk in. LOL, she’s six, and I just barely learned that at 34. I do know I will be more aware of bringing new items in (junkie treat bag stuff, pine cones, random ribbons, etc) because limiting those is what has made the biggest difference in keeping the rest of our newly simplified spaces neat and organized. 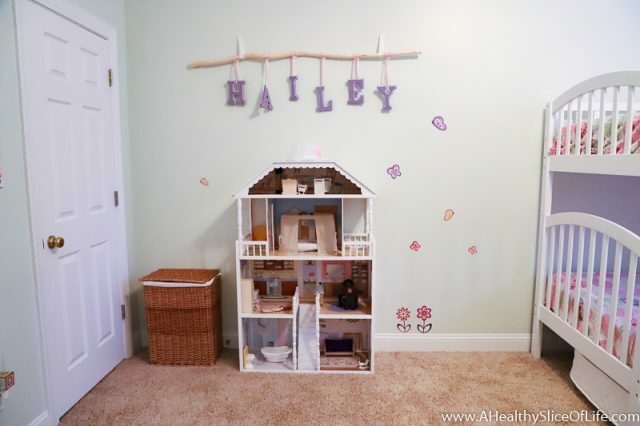 Next up, Kaitlyn’s room. But that may be a job for wine. 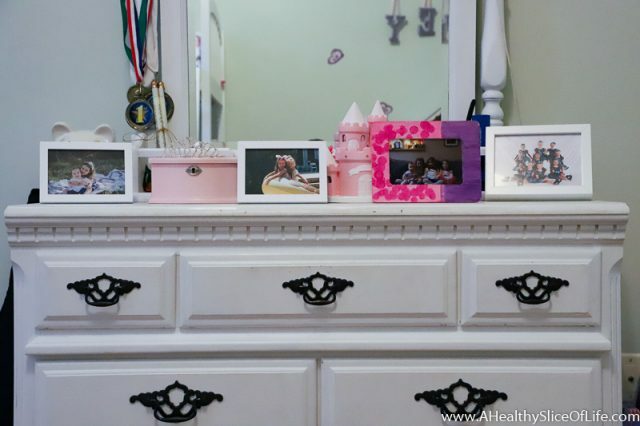 Do you have a great tip for keeping kids’ stuff organized? Mine would be- toss as much as you can! The room looks nice and neat–not like a 6 year old lives there 😉 But really–good job! It looks great! Such a good feeling to organize. I have a question about her bed? Do yall like her bed? I have a 2.5 year old boy who I am thinking of transferring out of a crib in the next few months. 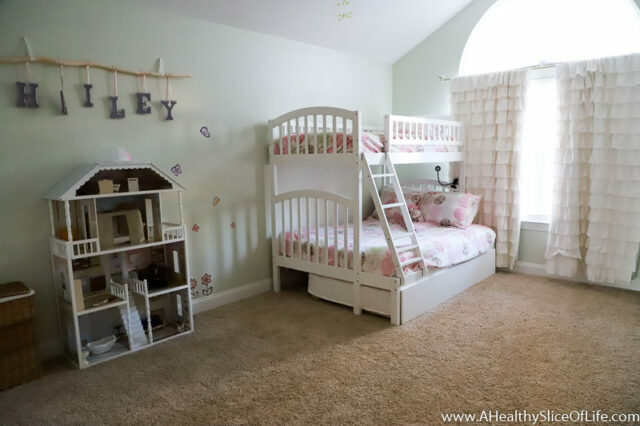 I love the idea of trundle or bunk beds but I am not sure! We love the bunk beds! I got it from Wayfair for about $500 but I looked and they don’t make it anymore. I was nervous going with lower priced bunk bed, but though it wiggles slightly, it feels safe. It is a great option to have the trundle when the cousins come visit too! Well done! Do Kaitlyn’s room in a morning (less likely to go with the wine :). John J. recently posted..Transgenders: Touchy Topic. What Do You Know? Looks great! We are hoping to buy our first home this year and I am trying not to buy anything to decorate their kids room with! Therefore, I would also like to know if you like the bed. 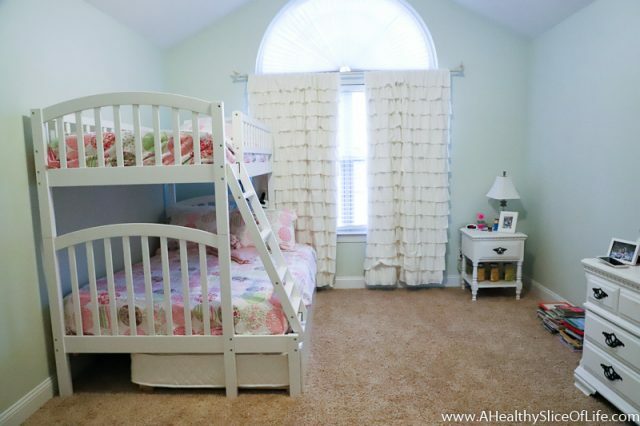 I have a 2.5 year old girl who shares a room with big sister and like the idea of bunk beds (full on bottom) instead of 2 beds to save space. We love having bunk beds! We thought about moving Kaitlyn in there, but they had trouble sleeping together, but we are going to start letting them do so on weekend nights. Great post. 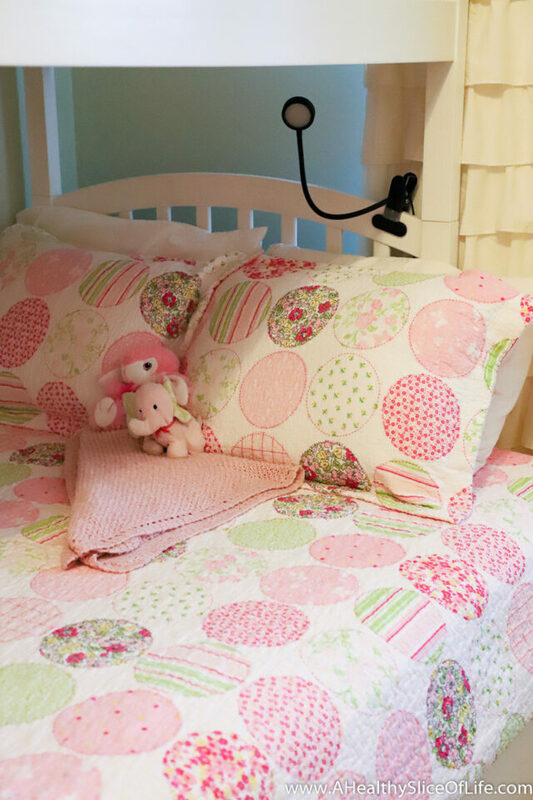 Can you share details about Hailey’s bed? 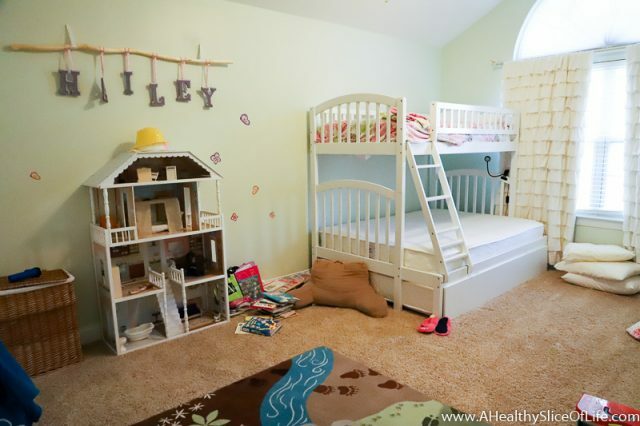 I’m thinking about moving my twin boys into bunk beds and I love the look of that one! Thanks! I got it from Wayfair for about $500 but I looked and they don’t make it anymore. I was nervous going with lower priced bunk bed, but though it wiggles slightly, it feels sturdy and secure. We love it! Oh I needed this. I’m actually pretty ruthless about getting rid of my own stuff that doesn’t work for me, but my almost-6 year old son is VERY sentimental about everything. His birthday is in about a month, and for the first time ever we’re letting him have a “present party” rather than requesting no gifts on his invitation. I’m trying to talk up how we need to make room for his new toys so he’s going to have to go through everything in his room and playroom and decide what to keep and what to donate/toss. He’s already really anxious about it. I don’t know how to make it a positive experience for him! I’m going to have to start this process much sooner with my baby (he’s 7 months old) so that he’s used to purging his toys every so often, rather than waiting until he’s 6. That’s a really great idea! I can tell him we’re clearing room for new toys and the old toys can go in to the waiting area, and he can ask for something back if he wants. I might sneak some stuff into it that I know he hasn’t been using for awhile. Or save the really good stuff for when the baby is older. I know that I haven’t really pushed for getting rid of toys in the past because I knew we would eventually have a second baby (although we waited 5 years!). I’m hoping that if this one goes well, we can make it a bi-annual thing (birthday and Christmas). I had my own “memory boxes” as a child that I could use to put in papers, photos, and other things I wanted to save. I’ve done it my whole life and it’s amazing to look back and have my kindergarten journal! Too funny. It’s only ended up being a few file boxes for 25 years and I love looking back at them! Wow! What took you 2 hours probably would have taken me 6!! I commend Hailey on being able to make quick decisions on what to keep and what not to keep. Good job girls!! 🙂 Her room looks great!! I’ll be honest, my son’s current room (4 years old) is about 10 times more messy than your before pic! I’m still finding my way as far as how much involvement I want in my boys’ organization of their rooms. Growing up, my mom would hand us a garbage bag once a year and it was up to us to fill it for donation. She didn’t care too much if our rooms were messy, as long as we could find things and weren’t holding on to stuff we don’t need (and it was for the most part “clean”). 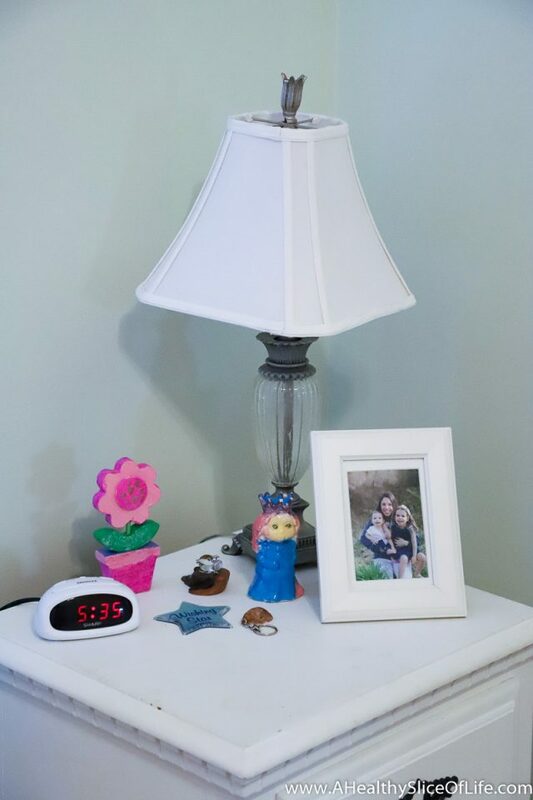 The majority of our main house stays fairly organized and uncluttered and so maybe in some sense the boys will learn by my example, but when it comes to their rooms I do want them to have a little freedom to keep things as they see fit. I’ll ask the four year old to pick up “all the old papers you don’t need” or “any random pieces of tape you find” or “any old food containers, cups, etc” but other than that, I am okay with some mess. In my eyes, his room is messy, with the walls covered in taped/ cut up pieces of construction paper and coloring book artwork, used Costco boxes scattered about, and an old chocolate box taped to the wall, but to 4 year old those papers mean something, the Costco boxes have about 100 uses, and the taped chocolate box is his homemade “mailbox”. It is definitely apparent that it is a four year old’s room and I’m okay with it (as long as I can still shut the door 🙂 ! No; I do not have any tips for keeping kids stuff organized. What’s so funny? I did this exact same thing to my 4yr old daughter’s bedroom yesterday. Great minds think alike : ) My daughter has way more junk – little nick knacks & whatnot for her dolls, barbies, whatever. She loves finding little things and putting them in large “diaper” bags & playing with them all over the house. It drives me cray cray because she will make messes wherever she’s playing. Our cleaning/purging session yesterday resulted in 2.5 large garbage bags going to be donated, that’s progress! Lana too felt like she had a new room and was so excited. Looks great! Do you mind sharing the paint color in her room? I’m looking for something similar! I tried to find the paint but couldn’t. We painted it several years ago and I have no clue now. I’m sorry! My kids are definitely hoarders. I tried to get them to part with some of their toys over the weekend and they each only managed to part with like three things each. LOL. We still have some work to do. My daughter is the biggest hoarder because everything has a story behind or some kind of sentimental value attached. I’m being patient but come summer, deep purge time! Oh my goodness am I envious! I have to go through my daughter’s room when she is at school and tell her I’ve put stuff in the attic – I’m talking birthday grab bags, little trinkets, all the JUNK. I do this about every 2-3 weeks and I’ve come up with a rule. Anything she brings into the house and puts in her room, she must choose something out of her room to give away. It helps a lot because I find they are getting A LOT of things from school each week. 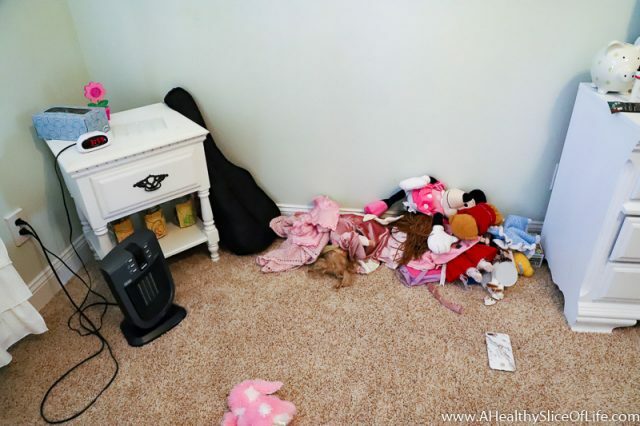 I find when I go through their room (at least at this stage in their life) and I’m the one to choose things that get tossed, it’s a lot less emotional for them. They haven’t ever asked where a certain item is that I’ve tossed. Now writing this I feel like I’m totally deceiving them, sigh. I’d love to do what you did with Hailey, I’m just not sure it would work with the personality of my daughter, age 6 also, who is constantly trying to take business cards, fliers, random mail into her room!! It’s not deceiving, it’s motherhood! Ok, that seems like it was way too easy for you! 😀 My kids are such hoarders and their rooms are driving me bonkers. They love small, crappy toys and everything is special to them! I just bought a Shopkin/tiny toy organizer today and I have a new toy storage unit coming, so hopefully I’ll be able to get rid of some stuff. I think it will be challenging, though, because my kids really do play with a lot of their toys. Their rooms are small, though, and it’s really hard to keep them neat! Hey if they play with them, that’s great! I’m grateful that my kids haven’t really gotten into the little toys. They have some Little People Princesses they love, but they don’t know what a Shopkin is (thank goodness ;)). A big toy box sounds like a great solution! It looks great!!! I have to tell you a similar story. About six weeks ago I started getting our house on the market. 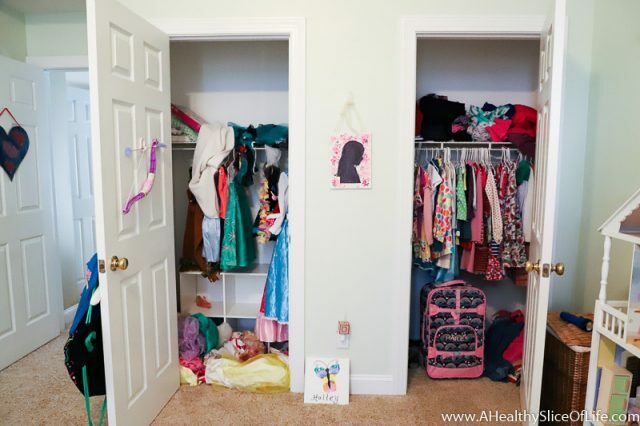 I am a minimalist and throw unnecessary items out on the regular–clean horizontal spaces are my love language–but I haven’t wanted to push my madness to my creative, artistic 5 year old. However, every time we went to clean her room it would take at least 45 minutes because her form of playing is taking everything out. I determined that the only way we could whip our house together for last minute showings would be to reduce the amount of toys in her room. I took two largish bins of toys out of her room/closet and gave away a small bedside table with storage that she used to put stuff in, and all the stuff in it. I braced myself for the complaints (they came). However, since then, it has been amazing! She hasn’t asked for her missing toys once after that first week. I’m kinda thinking she won’t get them back…is that awful? Good luck with the move! I hope it goes smoothly and hopefully park weather and sunshine will follow you to NC! What do you use for their memory bins? I definitely need something like that! Ugh the party bag favors!! I don’t use the word hate often but I HATE those things. Why bother with the junky 10 cent items, I’d rather not have a “parting gift” at all. Perhaps I’m just a Scrooge. 😉 excellent job on the room! I’m dying to get my 5.5 year old to help me with hers but haven’t found the time/energy yet (I’m 21 week pregnant with my 3rd 😜). You’ve inspired me though!! My daughter is sooooo into art her room is a mess of projects, papers and crayons and it drives me nuts!